How do bond index funds work? They’re not as easy as stock index funds. Stock index funds own shares of each stock in the index in the ratios found in the index. How do you do that with bonds? Especially when all bonds of a given issue may be held? Read on to find out. This post grew out of research I did to prepare a discussion about income in the United States for my church’s discussion group. As I prepared the presentation materials for the opening of discussion, I learned quite a bit about how fortunate I was and how things fit together. This post is based on the following references. Income, Poverty, and Health Insurance Coverage in the United States: 2012, United States Censure Bureau Report P60-245, 2013. An understanding of this information is important to making both personal and public policy decisions. $10,000 per additional member of the household. The $30,000 figure represents the income needed to live independently and provides basic housing, transportation for work, food security, and basic health care in the absence of chronic diseases or injury. The $40,000 figure represents savings for retirement and for maintenance of reserves to meet minor health emergencies, out of work contingencies, save to replace a vehicle, etc. The $10,000 figure represents the incremental cost of adding an additional non-working resident to the household. Thus, a single head of household with 2 children requires $50,000 for a basic standard of living and $60,000 for a secure standard of living. For a two parent household, raise these figures to $60,000 and $70,000. This figure shows the Census Bureau’s 2012 estimate of individual income density in the US. The bar height is proportional to the number of individuals in a $2500 band, for example from $40,000 to $42,999. Normalizing by the total number of people surveyed gives an estimate of the probability density function of income levels in the US. There are some inconvenient truths here. The important thing to take away is how income is distributed. A large swath of young (< 15) are counted as zero income. The median individual income of about $40,000 is well below the middle of the range considered in the survey ($50,000). 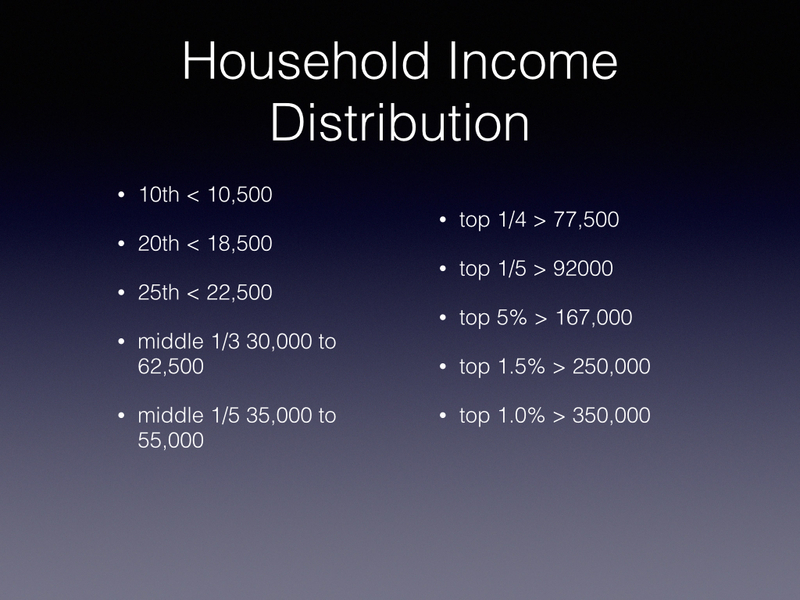 Household income has a similar distribution with the median income being $51,000. Because the data is gnarly, it is helpful to think of it by percentiles as shown by the figure below. 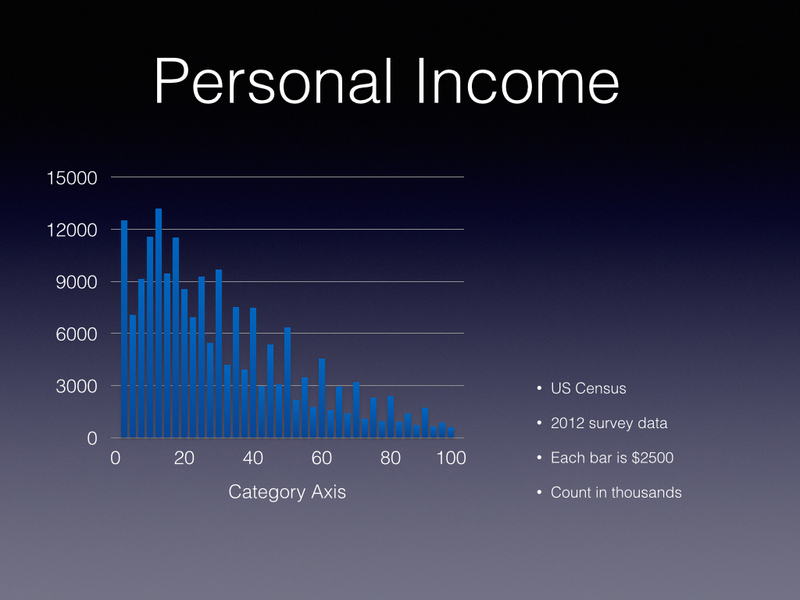 The figure shows some of the more important income bands. A percentile boundary represents the fraction of the population making less than that income level. For example, the tenth percentile tells us that 10 percent of the population earns less than $10,500. One quarter of us earn less than $22,500. One third of us earn between $30,000 and $62,500. Similarly, one quarter of us earn more than $77,000 and one fifth of us earn more than $92,000. Our doctors and dentists earn more than do 98 percent of us. The top 1.5% of income earners make more than $167,000 and to leave the 99% requires an income greater than $350,000. Let’s interpret the income figures in terms of standard of living. Most importantly, the bottom 1/3 of us do not have the income to live independently. The middle 1/3 of us range from struggling to get by to independent with some savings. A 90th percentile income, although statistically wealthy, is not practically wealthy and requires careful choices of housing, automobiles, children’s education, etc. 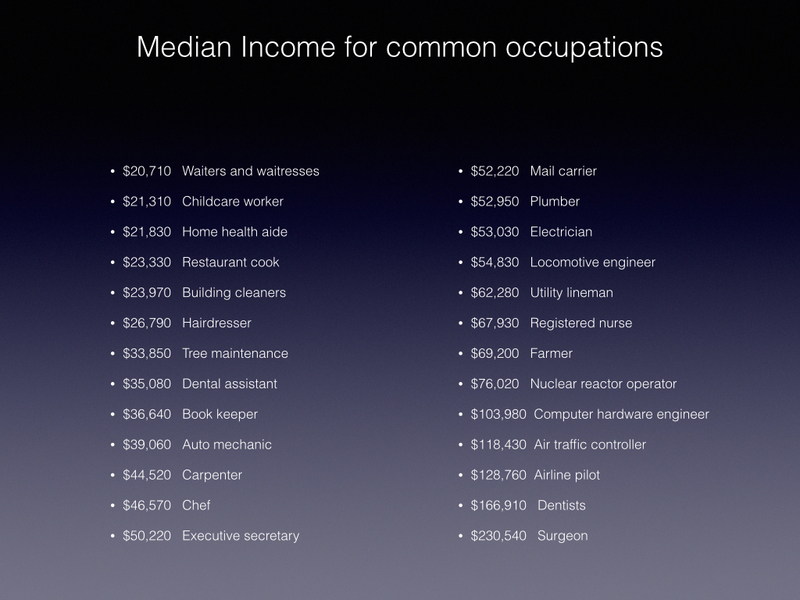 The table above shows median income for commonly encountered occupations. Median income is that income level dividing the occupation into two equal sized groups. Half make less than median and half make more. In choosing occupations from the reference, I was careful to choose occupations we commonly interact with. So barbers, auto mechanics, plumbers, waiters, cooks, janitors, dentists, surgeons, etc are all present as are some glamorous occupations like airline pilot. 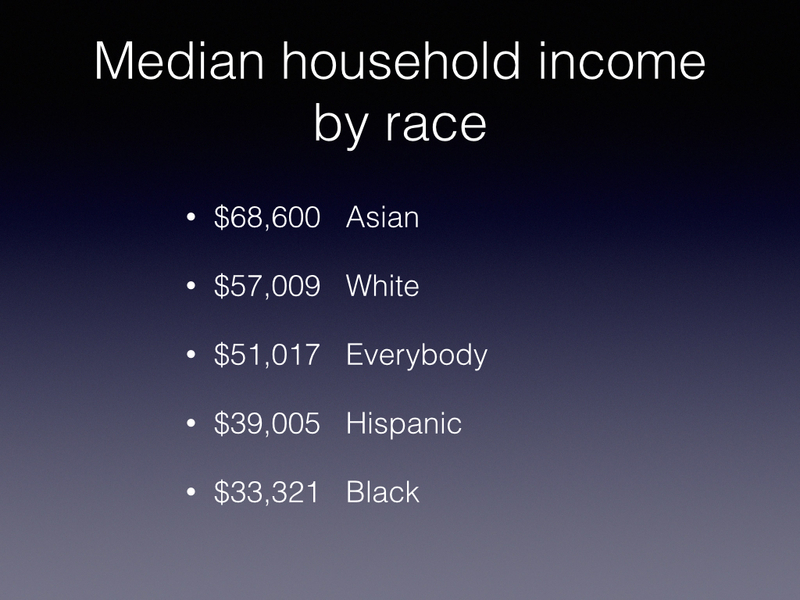 The table above shows median household income by racial group. Just the facts, no opinions and no rewarming of racial stereotypes. But half of black and Hispanic households are struggling as are maybe half of all households. 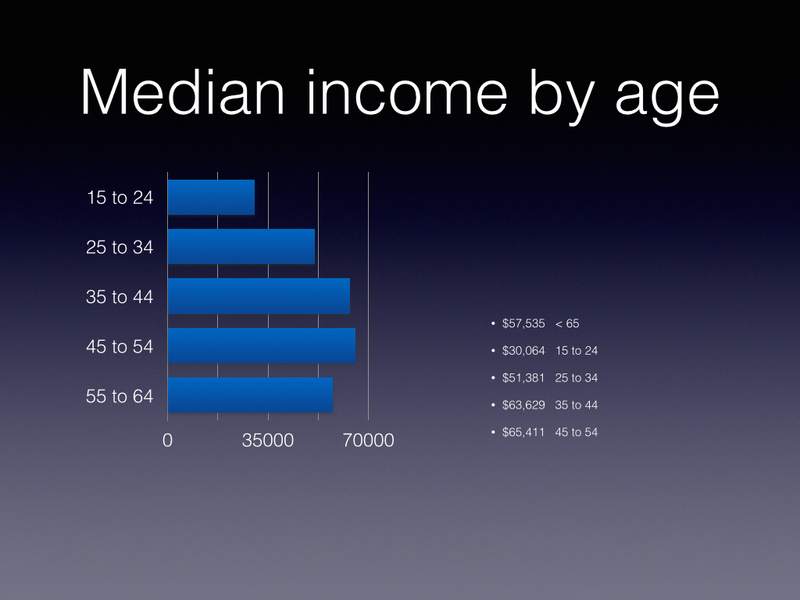 This figure shows median income by age group taking the 10 year slices commonly used. Other than the racial disparities, skill, experience, and the emergent nature of economic system behavior go a long way toward explaining these data. Broadly consumed goods and services must be either inexpensive or subsidized. For example, we all need our hair cut. To be affordable places an upper bound on the fees for this service and the earnings in the profession. The providers of this service don’t have a lot of pricing power because half of their market earns less than $40,000. The data show that the keys to upward mobility are educational attainment and experience in our profession, trade or occupation. But demand for services sets limits on upward mobility. First, we can’t all be rock stars or brain surgeons. The demand is not there. As the data shows, the most important thing we can do is to finish high school. After that, we can attend a trade school, apprentice in a trade, or attend college to acquire professional knowledge and gain experience in our profession being attentive to changes in demand for our services. Tax where there is money to be had, that is the top quartile. Jobs are demand driven. Subsidizing the bottom 1/3 of us produces demand for goods and services. Subsidizing the top 1% produces speculation or savings. And a few implications for personal choices. 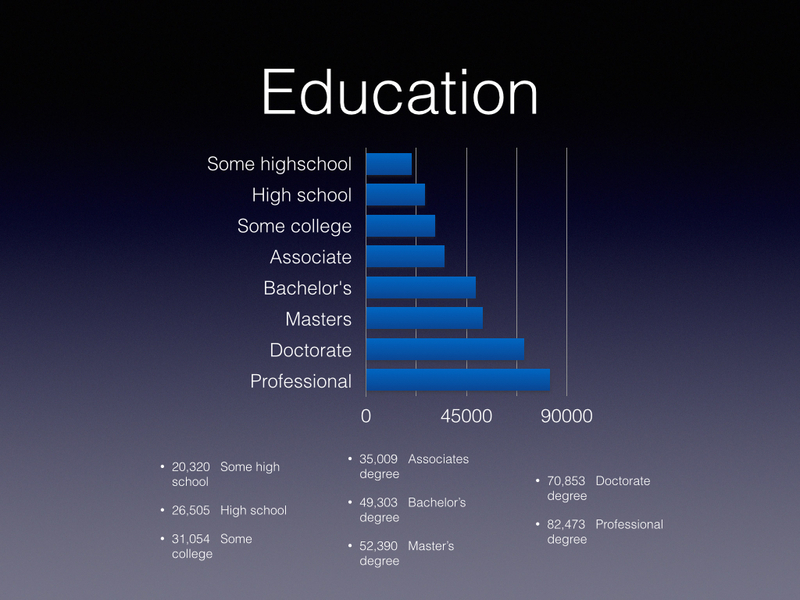 Education affords access to an occupation, trade, or profession that is in demand and pays well. Choose occupations, trades, or professions for which demand is growing or under-served. Be attentive to changes in demand for your occupation, trade, or profession and follow demand. Both of those have happened. Will you still love me when I’m 64? And Medicare sets you free from your employer’s health care plan! When that happens, my employer has nothing to offer that I want! That’s what I do so naturally, this winter I sat down and made some financial planning models. I’d done that exercise a year or so ago but was not satisfied with it. I began to look around for something more robust than my shaky advanced mathematics and found http://www.esplanner.com. Economic Security Planner is a sophisticated planning product developed by a Lawrence Kotlikoff, Boston University professor of economics, and his graduate students. It originally began as research with a spin-off company started to provide Windows software and web service. Professor Kotlikoff is a regular contributor to NPR’s Marketplace and to PBS News Hour. ESplanner is available as a web service and as a MS Windows program. The program version comes in 3 levels, basic, andvanced, and professional. The advanced and professional versions provide the same model but the professional version has client data management capabilities of interest to professional financial planners. The web service is layered with tiers similar to those of the program product. For most people, especially, those like me who keep a Microsoft Free Household (TM), the web service is the way to go. One program does not justify the hassle of Parallels and MS Windows administration when there is a viable alternative. You can try the basic planner as a web service. The free test drive lets you enter model parameters, make runs, and retrieve reports but you cannot save your model for future updating. ESPlanner offers several levels of subscription that make saving model configuration, support, and advanced features available. The advanced versions of the model offer a couple of additional features. Pessimistic planning assuming that you loose all of your stock assets. My first impressions of both of these features is that they are of limited use for assessing the basic adequacy of your retirement planning. What they do is offer some additional assurance that your standard of living is reasonably immune to market and economic events. Most free planners let you assume a yearly draw and determine the amount of assets needed to provision that draw at retirement. ESPlanner has a second mode of operation that answers the question “Given the assets I have, how much can I draw yearly?” Being in the position where wealth accumulation is drawing to a close, I used ESPlanner in this mode to determine what level of income my estimated assets at retirement would support. To my knowledge, this capability is unique and the results were reassuring. I was able to confirm that I held sufficient retirement assets to maintain my current standard of living. Lump sum income from estates, asset sales, etc. The model calculates the yearly discretionary spending that your assets can support. In ESPlanner’s terminology, discretionary spending is any spending that is not obligated by law or by contract. For example, your taxes, mortgage payment, and loan payments are obligated. ESPlanner estimates your Federal and State income taxes from your total taxable income. With the optional Monte Carlo feature enabled (at added cost) the model includes Monte Carlo analysis of sensitivity to historical stock market variability. This feature is useful for confirming that your holdings are adequate to survive stock market swoons and recoveries and inflation variability. The “Upside Investing” bit models the conversion of stocks to “safe” assets like bonds. Typically, you do this as you harvest growth assets to produce income. The process is a bit of a bucket brigade from stocks to intermediate bonds to short term bonds or cash. This is a rolling process because a good bit of the portfolio (50 to 65 percent) must remain growth invested to produce asset growth that keeps pace with inflation. The model does Monte Carlo analysis to confirm the adequacy of the asset migration plan in the presence of stock market swoons and recoveries. I found this feature less useful, possibly because I misused it. Mean inflation rate and mean investment performance for each investment account are model input parameters. ESPlanner recommends 3% inflation and 5% investment growth. I used these values. The 5% value may seem conservative but this value is picked to reflect your mix of stocks and bonds. This is an assumption that I need to verify from time to time. During 2013, the S&P 500, NASDAC, and Dow are all up handsomely with soft bond performance. Bonds are returning coupon. ESPlanner considers inflation and asset growth/shrinkage as part of the model but this does not appear explicitly in the reports. Rather, ESPlanner shows the reports in constant dollars. I find this easier to interpret than use of future dollars for future years. Future dollars make the inflation effects apparent but could mask declining real standard of living. In the spending model, Social Security is an input obtained from the Social Secuirty web site or the yearly mailng. For a single person, that works well. If you have a spouse, you and your spouse have different ages and different earnings histories, and you have dependents, Social Security strategy becomes a complex problem with about one million permutations. The purpose of the Social Security optimizer is to evaluate you and your spouse as a unit to determine the optimum Social Security utilization strategy. Who should be the primary, who should be the survivors. Should one of you start and then suspend benefits? If you are single, the result is obvious as explained below. If not, then you need to use this model. ESPlanner, Inc offers a Social Security optimizer. I gave it a try also and was surprised! The Social Security Optimizer told me I should delay collecting Social Security until age 70. Being a single male, this is a pretty simple decision. Delaying to age 70 to begin drawing Social Security increases your yearly draw by 1/3 from a defined benefits inflation protected source. By doing so and putting this result into the ESPlanner spending model, I was able to show that my yearly spending could increase relative to starting Social Security at age 66. The increase was significant. This result seems counter intuitive so some explanation is in order. In the age 66 scenario, you must conserve assets early in retirement to maintain late in retirement standard of living. By delaying until age 70, those sequestered assets are freed to pay income during the shorter 100% out of pocket period. Basically, you are betting that you will live longer than the median life expectancy which Social Security uses to determine the payout rates. The Social Security early and late start adjustments are actuarially neutral. If your family history suggests, as mine does, that you will outlive median life expectancy for your cohort, it is a reasonable risk to take. My aunts and uncles not claimed by lung cancer or early colon cancer lived into their late 80’s and both paternal grandparents lived past 90. Given that I don’t have the risk factors (smoking, agricultural chemicals) of the early mortality uncles, It is a good gamble. The other thing that surprise me was that Social Security would be a significant fraction of my after-seventy spending. For me, about half, maybe a bit more. A big surprise since I’m about a 92 to 93 percentile wealth unit. I’d assumed that Social Security would be providing Starbucks Money. Suddenly, I’m very much more interested in the shenanigans of the Republican House of Representatives now that I know Social Security will be doing more than buttering my bread.